November 2016 ~ Christmas A Go Go! When scanning new Christmas compilations and tracks, I usually pick the most outrageously titled songs to listen to first. When looking at the tracklist of Candy Cigarettes' 4-track EP, you'd wanna hear 'A Whale's Christmas in Childress, TX' first too, no? Candy Cigarettes = Lane Mueller from Portland Oregon, who writes sweet indie rock songs. Listen to his first album, the song 'The Party's almost over' is really really good. Californian folky singersongwriter JJ Heller loves the holiday season. She likes tunes like 'White Christmas', 'Let It Snow' or more Christian ones like 'O Little Town Of Bethlehem' or '' O Come, O Come Emanuel'. She says: "I hear just a few notes of these familiar tunes, and somehow I'm six again opening stockings with my family, or driving around my neighborhood looking at Christmas lights." You can all find them on her new album 'Unto Us'. Thanks for all your song submissions for the 50 Best Christmas Songs list we're making as response to Pitchfork's uninspired list of the same name. You can add in the comments, or in this communal Spotify list. If you're called Pete Green and you're a musician, you might be mistaken for former Fleetwood Mac guitarplayer Peter Green. It took a while before I found Sheffield, Yorkshire's Pete Green's website. Pete was mentioned in the comments of this post, I'd never heard of the guy. The song, this song, is really beautiful. Thanks Stubby! Alas, it's not on Spotify, so I cannot include it in this list. Nice, melancholic jazzy waltz about the Day After (or Boxing Day) by Chicago-area singer/songwriter Kevin Andrew Prchal . Irvine, Kentucky's N 6 4 made his second Synthetic Christmas album, with music to haunt you 'round the Christmas tree. 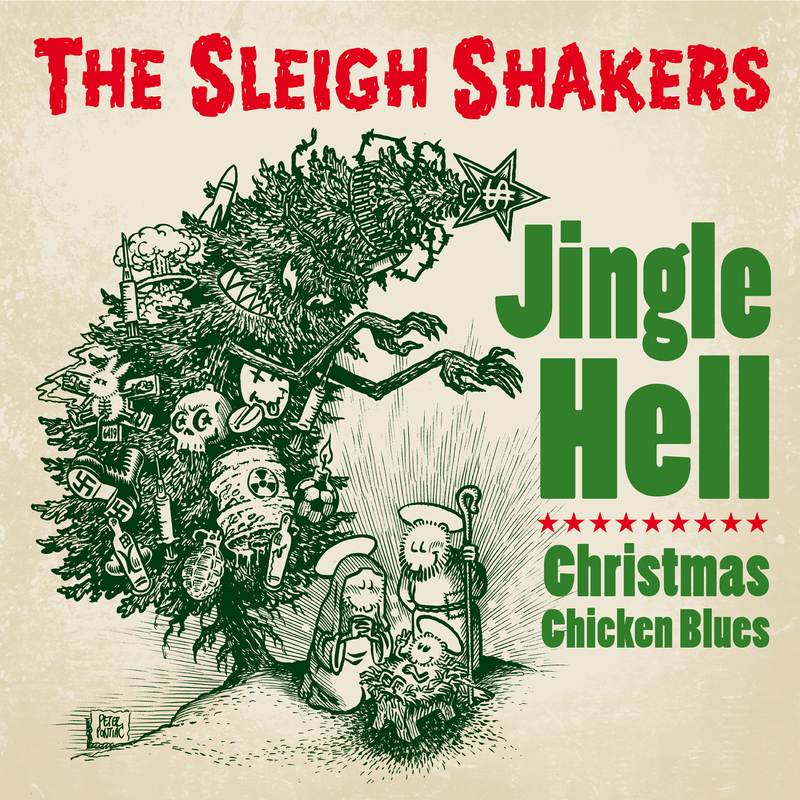 Slowed down choirs, bleeps and weird fx probably are not everyone's idea of jolly good Christmas music. But on a blog that praises the weird & the wonderful, this music find a warm home. Canadian Robbie Duguay also synthifies Christmas, for the 4th time he reimagines Christmas carols and xmas pop as music for console games from the 80s and 90s. Fourteen original Christmas albums on ten CD's! That sounds like a bargain and it is. In this little box you can find original old jazz albums from folks like Johnny Mathis, Louis Armstrong, June Christy, Andrew Sisters, Ella Fitzgerald, Ramsey Lewis Trio, Stan Kenton etc. It's a very cheap package but there is hardly no information about the recordings and no pics of the original sleeve. The music says it all. This Johnny Mathis song isn't among his fourteen songs on this boxset. Sure, one of the perks of making a Best Of-list is that someone else can disagree with it. But this Pitchfork-list is so, as CU tweeted, uninspired it's getting me nauseous. There are non-Christmassongs in the list. Songs that are overplayed. Two versions of the same song. And Low's Little Drummer Boy instead of Just Like Christmas? Really? REALLY? Let's get a few things straight. When making a Best Christmas Songs-list, you need to set ground rules. Do hymns (O Come, O Come Emmanuel), traditional Christmassongs (O Tannenbaum) and pop songs compete with each other? Do you choose original versions or best versions? And, maybe the most important thing, what does your (play)list achieve; to heighten spirits, to have plain fun? Pitchfork's list just f's around, there's no real idea behind it. So, whatabout us, CAGG-team and you, readers, make an alternative Best Of-list? Songs that are criminally overlooked by Pitchfork. Pop songs, rock songs, funk tracks. No hymns, no traditional songs, all original tracks from, the sixties 'til now. 50, to start, but if we get to 100, why the hell not?! Goal: to have a jolly good time in the days before Christmas. To me, personally, a good solid Christmas pop song (with pop I mean non-classical, every other genre is allowed) is ABOUT Christmas. This sounds odd, but Pitchfork chose John Coltrane's 'Favourite Things'-version. Great version, no doubt. But no song and not about Christmas at all. And take 'Jesus', by Big Star, same thing. It's about the birth of Jesus, which we celebrate at Christmas. Let's not get biblical here, or scientific, but a song about Christmas is (to me) about the festivities and the feeling, not the facts (or, if your an atheist, 'facts'). A good Christmas song, even if it's anti-Christmas, is at heart a song about longing. Longing to be together, to celebrate together, or to NOT celebrate, NOT be together. 'Driving home for Christmas' is probably the best example of the feeling I'm talking about. It's aspiring, it has a huge sense of nostalgia, instead of actually celebrating the fest. Again, anti-christmassongs have that same sense, old experiences make the singers/artists rail against the obligation to celebrate Xmas. And, to be frank, the longing is better than the celebration. Hope I made mayself clear. I've created a communal Spotify-list (HERE), to which you can add your song. But please, before you do, make a comment below about WHY this song has to be in that list. I've contributed Futureheads' 'Christmas was better in the 80's', because a) it's a fantastic song and b) it has that sense of longing and nostalgia that makes a great Xmas track. And I've added Low's 'Just like Christmas' and Ron Sexsmith's 'Maybe this Christmas', because, well, these songs NEED to be in a 50 Best Christmas Sogns list. Really. FINALLY a brand spankin' new DUTCH Christmas song. Sung by girl duo Clean Pete and Marien Dorleijn (he of the band Moss). 'Gaan we kerstmis samen vieren' (Are we gonna celebrate Christmas together) winks at 'Dream a Little Dream of Me', which is nice. If good ole music from the heartland is up yer alley, try Red House Records' compilation Christmas on the Lam, featuring big shots like John Gorka and Dale Watson (the fantastic Christmas and Me), sultry singers like Davina (and her Vagabonds) and more. You can stream the comp on the RHR site. Almost every year Putumayo comes up with an exotic seasonal album. 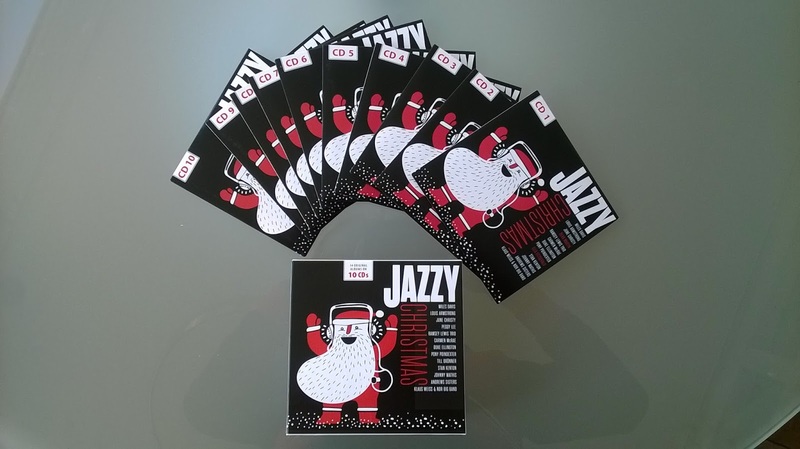 This year it's 'Latin Christmas' which celebrates both regional and global classics interpreted in bossa nova and other Latin and Brazilian styles. You find Juan Carlos Quintero do 'Jingle Bells' or Roman Street do 'Christmas Rhumba. Listen to Erica Gonzaba play 'Blanca Navidad. Like every year Dutch label Snowflake Records comes with a bunch of original Xmas 7 inches: this year four different surprises! The Manhattan Love Suicides are from Leeds and remind me of Sonic Youth, specially side A, 'Look Who Is Coming To Town (Please Let It Snow)'. B-side is a great cover of Elmo and Patsy's classic 1979 Christmas novelty 'Grandma Got Runover By A Reindeer'. The Haywains from Midsomer Norton, England, play catchy pop. 'Who Needs Summer?’ sounds a bit summery. And‘Santa Claus Is Coming To Town' is great raunchy pop. 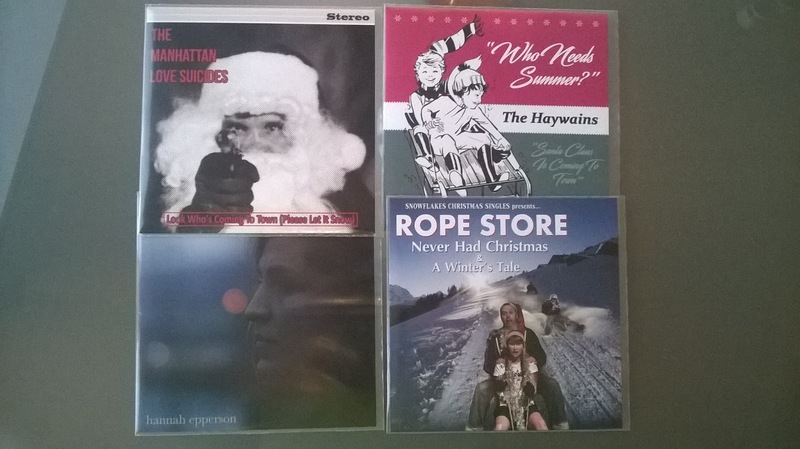 'Never Had Christmas / A Winter's Tale' is a single by Rope Store. They sound like seventies glamrock. The B-side is a rework of a David Essex song from 1980. My mind was blown away by the eerie version of ‘White Christmas’ from American violinist and singer Hannah Epperson. It is nearly a modern classical piece, very original but unusual, just like her song 'Raise The White Flag’. Yay! Finally an odd Xmas song to share. It's from 2012 but I'd never heard it before. But the biscuit's taken by a cool version of Reuben Anderson's bluebeat-christmas track Christmas Time Again. Couldn't find more background info on Tracy, but this bluesy, country-style Christmas song sure is nice. It's from TM's debut album, available on cdbaby and Spotify. The Statuettes from Salt Lake City recorded a gentle indie-rockin' Christmas tune, reminiscent of early Lemonheads and Red House Painters. Stubby wrote a cool piece on the Sloan-xmas single. Canadian indierockers Sloan are probably best known for their 'Underwhelmed' single, which is still a big hit in my house. Beach Boys on a budget, that's how I'd describe this Xmas track by Brooklyn-based Youth Yamada. Though this one man band was a finalist in a John Lennon Songwriting Contest, and yes, the Beatles as an influence are quite near too. BEST NEW CHRISTMAS SONG OF THE SEASON ALERT! Scandi-duo My Bubba released an angelic beauty of a song, a waltz to warm icey hearts (and feet, if needed). Thanks to Christmas Underground for the discovery. Staring with a minimalist synth riff and slightly distorted bass riff and digital drum pattern, sonically reminds me of early Suicide. When the vocals kick in, it takes on a completely different vibe. Vocally reminiscent of The B-52s, the lyrics tell a story of a white trash Santa Claus ruining the most wonderful time of the year by going on a drinking bender instead of handling his holiday responsibilities. For the 7th time, A Rock by the Sea releases a must-have of new seasonal songs and classics-covers. Haven't had the time yet to listen to all tracks (I'm sure our friend Stubby will write an extended review), but a track called Casserole Season, I just have to post that one right away. 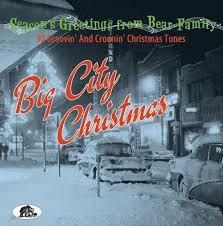 'Big City Christmas' is a delicious compilation, carefully compiled by the German quality label Bear Family. If you like 50ties music with that old christmassy feeling, this is the place to be. Most of the tracks are not obvious choices from artist we know too well, like Pat Boone, Brenda Lee, Chuck Berry, Eartha Kitt, Doris Day. There are even a few novelties like 'North Pole Rock' from Cathy Sharpe or 'I Want A Beatle For Christmas' from Patty Surey. Countrysinger Kacey Musgraves does surprise us with a very nice album full of own songs and fine versions of songs like 'Have Yourself A Merry Little Christmas', 'Let It Snow' or a very rare cover of 'I Want A Hippopotamus For Christmas'. And... any holiday song with Willie Nelson is OK, like 'A Willy Nice Christmas'. In 2014 The Connection from New England (USA) delivered their holiday album 'A Christmas Gift For You'. This year it seems to be re-released, for the Dutch market anyway. So finally Holland gets to know their rocking and raunchy songs like 'West Coast', 'Rock 'n Roll Christmas' or 'Money, Honey, Baby'. 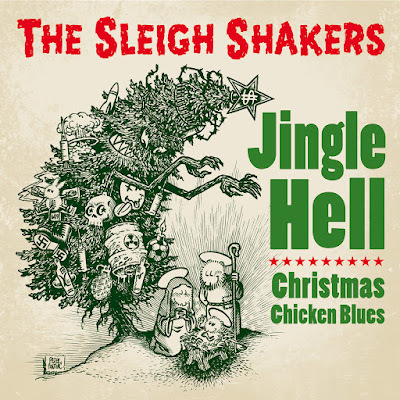 Plus their great cover of the Ramones classic 'Merry Christmas (I Don't Wanna Fight Tonight)'. Some songs have been written with Andy Shernoff, once in the notorious punk outfit The Dictators. A real R&B Christmas treat: megastar R.Kelly releases his first Christmas album, '12 Nights of Christmas'. Before he released a few holiday songs throughout the years including “A Love Letter Christmas,” “Christmas I’ll Be Steppin’,” and “World Christmas.” The album contains 12 tracks most of them originals and very christmassy r&b ballads. No, The Prissteens isn't a girlgroup, but the wall-of-sound-vibe you expect with a cover like this is very real on this track. AAAAaaannnd we're back! Come back regularly to find the newest, the odd, the cool, the weird and the wonderful seasonal songs out there. Kicking off with a really cool song we missed last year. We've got that jingle tingle again!